It doesn’t surprise us that the Asscher cut is the fourth most popular diamond cut in the world. This stunning cut promises a brilliance that is near that of the brilliant round while displaying the quality of a stone in the manner that an emerald cut would. The Asscher cut is also extremely versatile in the ways it can be set, making it an easy choice for both brides and grooms to be. The Asscher cut gained its popularity in the 1920’s during the Deco Art movement, but has done an impressive job retaining it since. This cut was first created by Joseph Asscher in 1902 but was modernized in 2001 when the Royal Asscher cut was created by Joop Asscher. The standard Asscher cut, which contained 58 facets, can be likened to the Emerald cut, as they look extremely similar from a head-on angle. Unlike the Emerald cut, though, the Asscher cut removes the corners forming an octagon out of the squarish shape. Unlike the Emerald Cut, the Asscher cut is also a deeply cut ring, which allows it to create the brilliance that the Emerald cut lacks. The royal Asscher is extremely similar to the standard Asscher but it contains 75 facets and a higher crown – both characteristics allow this version of the Asscher cut to have more fire and brilliance than its older counterpart. Note that if you are in the market for a royal Asscher cut, be diligent as to where it is being purchased from – this cut has an exclusive patent on it so newly purchased royal Asccher cuts can only be purchased from the Asscher Diamond Company. 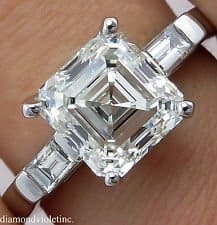 The best thing about the Asscher cut is that it combines, though not to the same degree, the positive attributes of its popularity predecessors into one marvelous cut. This cut is deeper than the Emerald cut, allowing for more brilliance, while having larger facets than the Brilliant Round Cut, also allowing the cut to showcase the quality of the stone and cut itself. The Asscher cut is also extremely versatile. 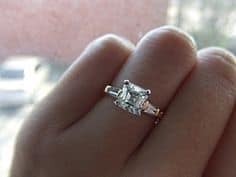 While it does demand a higher grade stone, which might raise a red flag for a bride or groom on a budget, the stone doesn’t have to be a diamond. The Asscher cut works extremely well with gemstones, preferably ones higher up on the hardness scale. For a full directory of gemstones, visit our gemstone directory here. Finally, the Asscher cut has no delicate edges. Because of its rounded out edges, the Asscher cut is a wonderful choice for a bride or groom that does hand-on labor for work or pleasure, and it also allows for a variety of settings for the stone. The biggest con of the Asscher cut stone plays on one of its biggest perks – it highlight the quality of the stone to the extent that even the smallest inclusion or blemish in the stone will be visible to the naked eye. As a result of this negative quality, the buyer of an Asscher cut stone must ensure that the stone they are buying is in the best possible shape – this particularly effects the budget friendly couples, but can be easily resolved through synthetic stones and gemstones! Another negative trait of this cut is the way it is shaped. In order to provide its brilliance while highlighting the quality of the stone, the Asscher cut is extremely bottom heavy – what this means is, the majority of the rock is underneath the surface. As a result of the rock being bottom-heavy, a 1 carat Asscher cut might look like it’s smaller than 1 carat to the naked eye. If you want a statement cut but don’t want to go over 1 carat, this cut might not be the best choice for you. The Gemological Institute of America (GIA) has created an international diamond rating system that allows for a universal standard for determining a diamonds quality. An aspect of this quality is the diamonds clarity. A diamonds clarity is determined by its number of inclusions and/blemishes. All diamond will have some inclusions and blemishes, but a flawless diamond will be one where they can’t be seen when magnified by ten. Flawless (Fl) – No Inclusions. Internally Flawless – (IF) No inclusions, only blemishes. Very Very Slightly Included – (VVS1 and VVS2) Contains inclusions but they are very difficult to see. Slightly included (SI1 and SI2) – Noticeably included. Included (I1, I2, I3) – Obviously included. An ideal diamond for an Assher Cut will be anything from VVS2 and up. Avoid Asscher cuts that fall into the categories of SI1, SI2, I1, I2 and I3. The GIA also grades diamonds on their color – or rather, lack of. This rating system does not include colored diamonds. Essentially, the ideal diamond is colorless while the least desirable is light yellow or brown. These changes in color are extremely subtle, and may not even be noticeable to the naked eye, but they make a colossal impact on the price of a diamond so they are important. This list contains a list of the color ratings, D being completely colorless and most valuable and Z being of color and the least valuable. The ideal Asscher cut is colorless, so grades D, E, or F – however a nearly colorless grading that’s closer to the completely colorless spectrum, such as G, will also produce desirable results. Due to its rounded edges and combined brilliance and show ability, the Asscher cut can be set in a number of settings, of which we have narrowed down four of our favorites. As with any ring that displays brilliance, our ideal setting for an Asscher cut diamond is the 4 prong setting. A 4 prong setting will allow light to cut through the diamond and maximize the brilliance of the cut. That said, for a larger diamond, a 6 prong setting might be necessary to avoid damage or looseness of the diamond itself. For smaller Asscher cut diamonds, we are fond of the Channel setting. A Channel setting is one in which a number of small-cut diamonds are set side-by-side in an empty channel within the band, allowing them to feed off the brilliance of the other. A channel cut does take away from some of the natural sunlight that is necessary for this cut to obtain its full range of brilliance, but it does cohesively pay respect to the beauty in the cut and stone itself. The Trellis and Cathedral settings are also popular choices for the Asscher cut, both of which use the precious metal of the band itself to accentuate the beauty of the cut. The Trellis cut uses the precious metal to create interwoven prongs that provide a mature aesthetic to the ring as a whole. The Cathedral setting also uses the precious metal of the band but not to create prongs – in the Cathedral setting, the stone is held up by standard prongs while the precious metal of the ring itself creates two magnificent arches on either side of the stone. Both the Trellis and the Cathedral settings are spectacular choices that also hold the stone higher than a traditional four prong setting, allowing more light to penetrate the ring and create more fire and brilliance within it. Ok, so, what do we know? The Asscher cut has a long history which has caused an evolution in the cut itself – the standard Asscher cut has 58 facets while the royal Asscher cut has 75 but should only be purchased through the Toyal Asscher Diamond. Co. due to its patent. The Asccher cut showcases the quality of the ring while creating brilliance and is beautifully utilized in gemstones, but also calls for higher quality stones and may not appear as big as it actually is. The Asscher cut does not have any sharp edges, which allows for a number of beautiful settings including the 4 prong, Trellis, Cathedral and Channel settings and, of the three, our favorite is the 4 Prong setting. PHEW! . 1. If your Asscher cut stone is a diamond, deal only with reputable jewelers that will provide IGA certification. 2. If you’re buying a used or antique diamond studded ring, don’t listen to number one. The IGA hasn’t been around forever and diamonds have. Instead, in the instances of antique or used diamonds, ask for a certificate of authenticity or professional appraisal of the diamond you’re buying. 3. If a colored, or colorless, gemstone is you’re thing, we’re into it. Check out our extensive gemstone directory for ways to ensure your are purchasing the best quality authentic gemstone for your ring. 4. It never hurts to get a second opinion – if you’re confident in your purchase, this isn’t necessary, but if you’re like us and like play it safe, take your purchase to a professional jeweler or gemologist for a second opinion as to the quality of your stone. 5. You’re getting married! This should be the most rewarding and enjoyable experience in your life to date – while we absolutely promote the idea that knowledge is important, and that you should be well informed, we also want you to remember not to lose sight of your excitement and joy, so go on, go shopping for your engagement or wedding ring and don’t forget to have fun with it!